They’re the duo who fuses modern and vintage styles with playful sophistication: they’re Rob Blackard and Bob Beidleman, founders of the Rob & Bob Studio, and we’re thrilled to have them return to our Meet the Maker series. (If you missed our first post, you can check it out here). Continuing their mission of creating art that inspires, they showed us some of their recent favorite projects that share the common theme of incorporating fabulous fonts. Thanks so much for joining us again. Let’s get right to it: please tell us about your fonts. 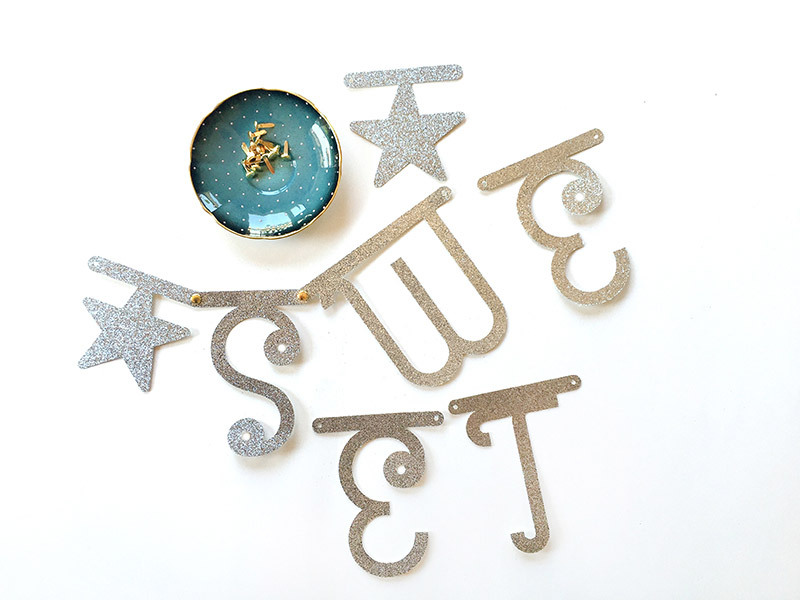 There are some fun fonts our there for sure, but to get all the functionality and precision from Cricut, you really need a font designed from inception to be used with a cutting machine. We really enjoy the process of creating original fonts for Cricut. It's much more of a creative challenge than doing a normal font. We have to not only make sure it looks great, but it also has to be cut able at various sizes and offer stenciling for certain characters. Most importantly, it needs to write using Cricut's unique Draw feature, which is one of our favorite Cricut Explore highlights. To be able to write fonts in a smooth, natural looking way with a single pen stroke is really amazing and something we work very hard on. Before we talk about specific projects, can you bring us up to speed with what you’ve been doing since your spring Meet the Maker article? Like a lot of people, we've been balancing work, family time and having some summer fun in the sun. In addition to creating these new font projects for Cricut, we completed a new fabric collection that should be out early next year. We’ve also been developing our online art-print website and even been consulting on the redesign of a small mountain resort. That's what we love so much about creativity: it often leads somewhere unexpected and exciting! 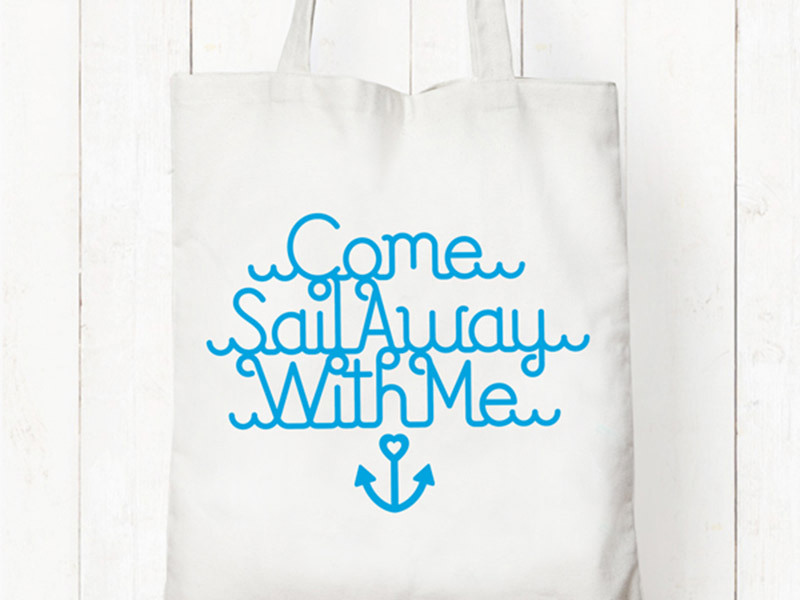 Did your “fun in the sun” contribute to your Sail Away with Me project? Yes! We were in Laguna Beach at the time we created it. We were really inspired by the ocean and beautiful coastal setting. From this, we knew we wanted to incorporate watery washes of blue and turquoise into the project. 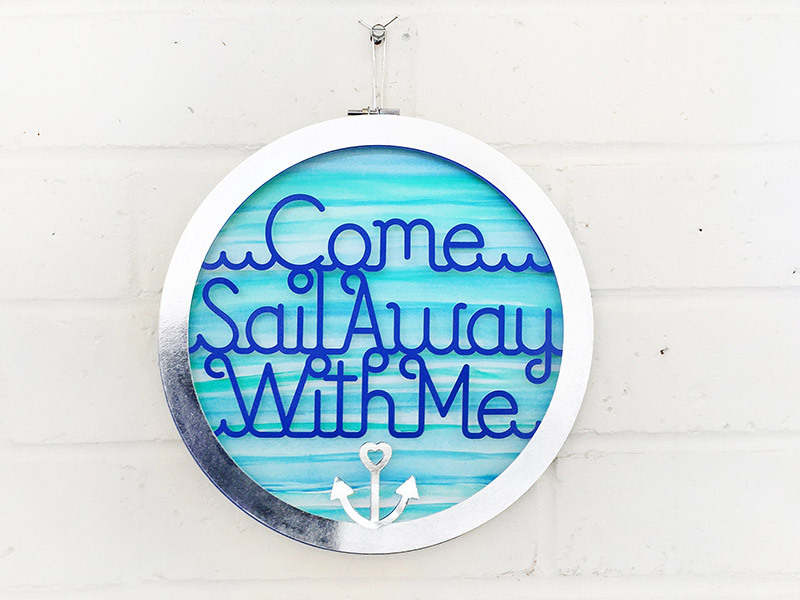 Our Sail Away Font, with its letters that flow into each letter like waves, and the dreamy phrase seemed to work perfectly together. Each time we look at the finished project it transports us back to the beach! Washes of watery blues and aqua create a soothing background for this dreamy dimensional art piece. What materials are needed to make this nautical charmer? 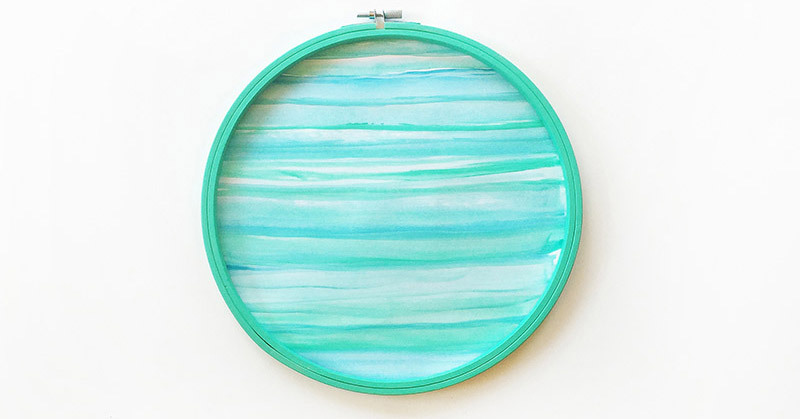 Start by painting the hoop your favorite color from your palette. 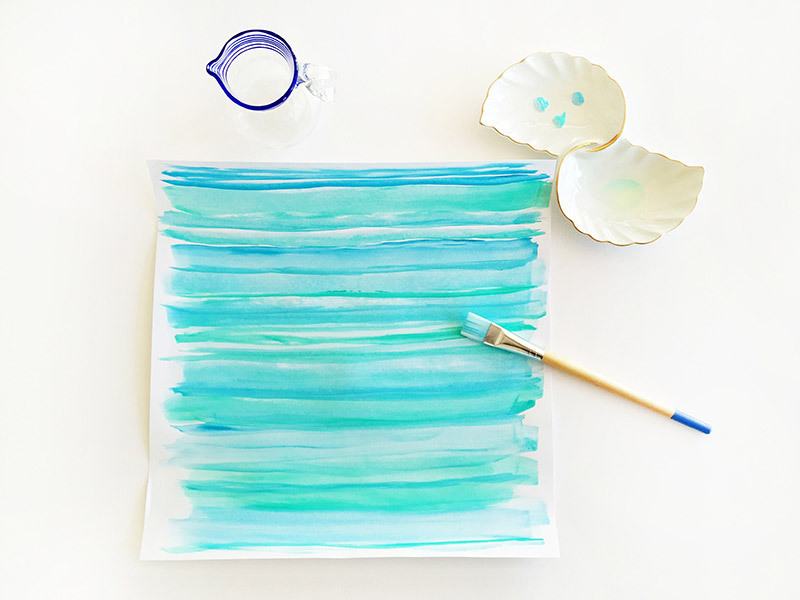 Mix a bit of water with your brush and begin making wide, washy stripes across the watercolor paper. It’s best to alternate colors and widths of your stripes. If you aren’t experienced using watercolor paint or paper, don’t worry. This is an opportunity for you to have fun and experiment. Remember, you can’t get it wrong! 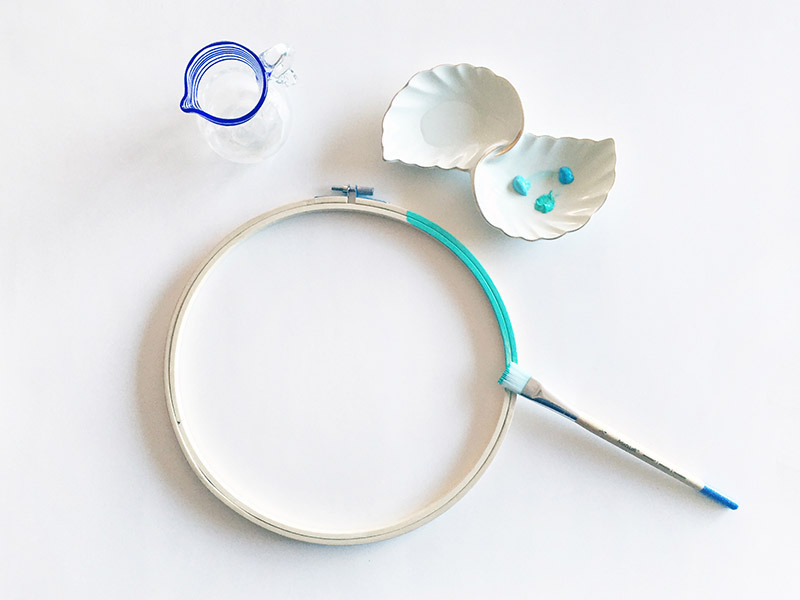 Once it is dry, adhere the watercolor background layer to the back of the hoop. On the front of the hoop, adhere the cut-word layer to the top edge and then adhere the anchor layer, followed by the rim. Use a silver cord or ribbon to hang your finished piece. As always, feel free to experiment with colors, textures and materials for a piece that’s uniquely yours. The most important step is to have fun! Rob & Bob also included an option that’s perfect for iron-on, vinyl and sticker projects. 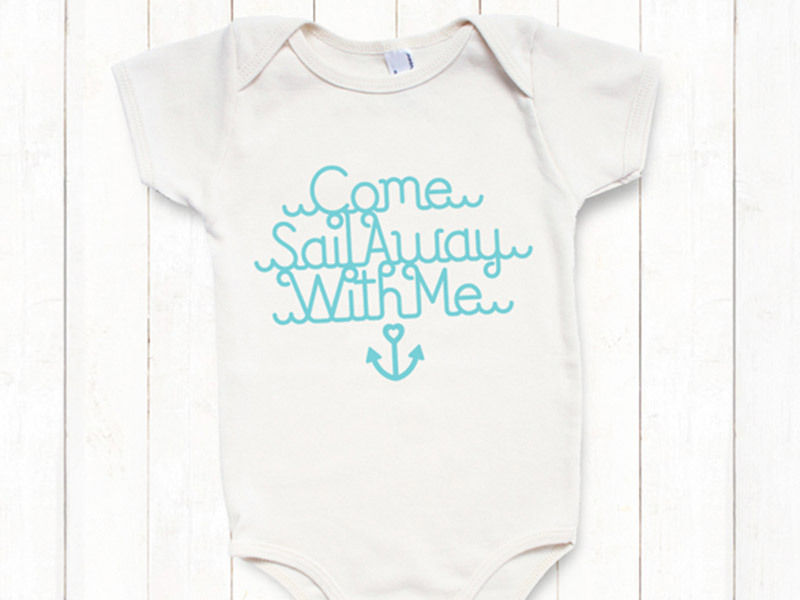 Wouldn’t your favorite baby make waves in this adorable one-piece? 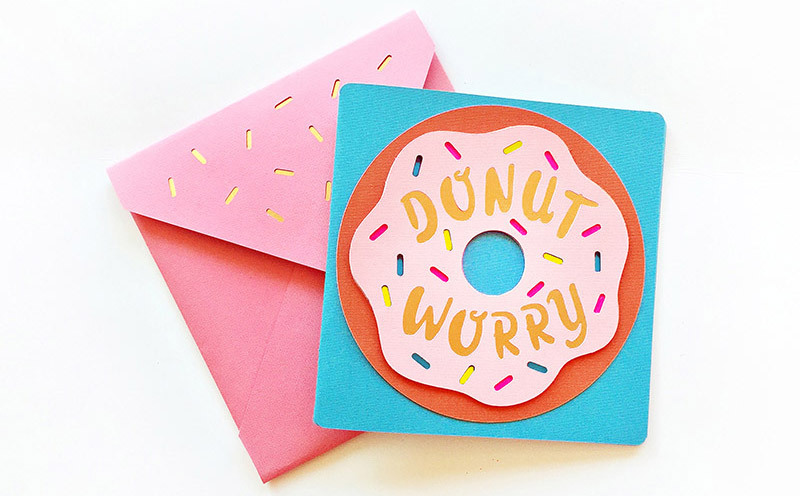 Tell us about your next font project, a sweet DIY paper craft. The witty wordplay in these next two projects really showcase many of the options found in our Market Street Fonts cartridge. 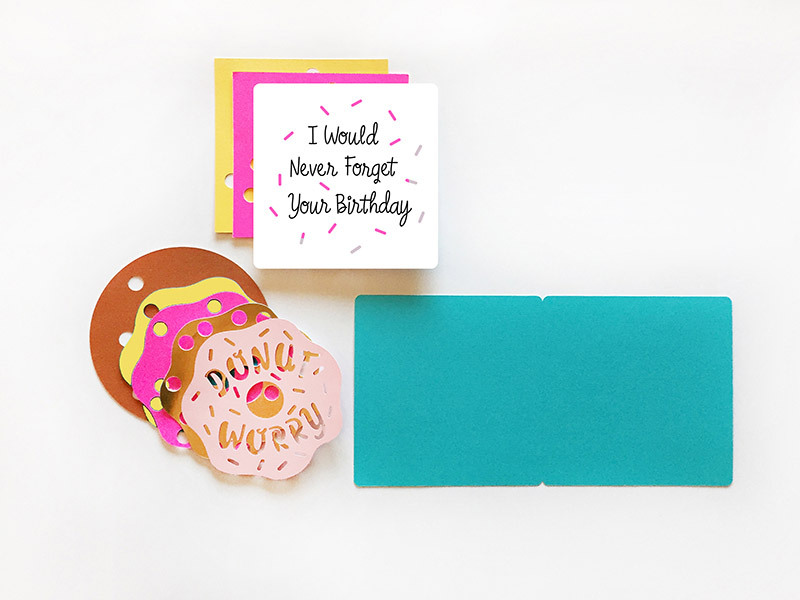 This deliciously adorable card and matching sprinkle envelope will make anyone’s birthday a happy one! 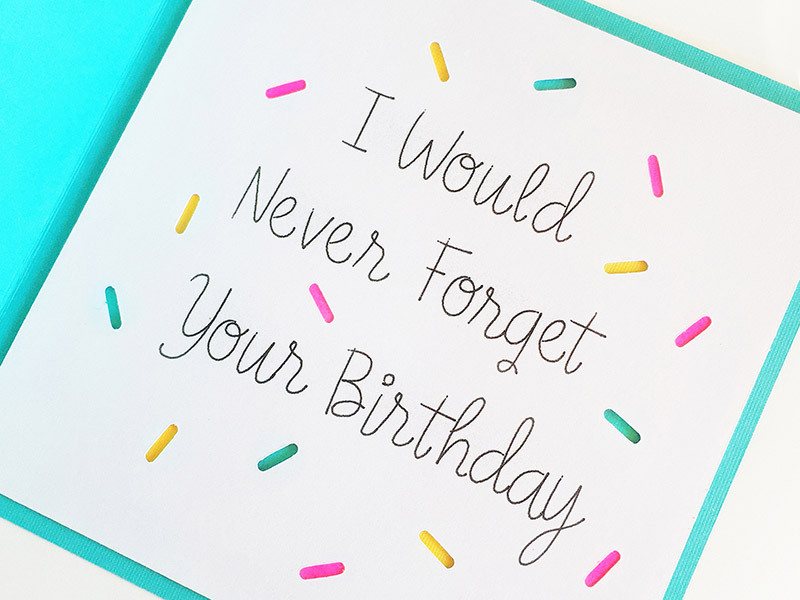 Rob & Bob used their Eloise Font to create the card cover as well as the inside written greeting. You can get the complete font here. In addition to a Cricut, what materials are needed? 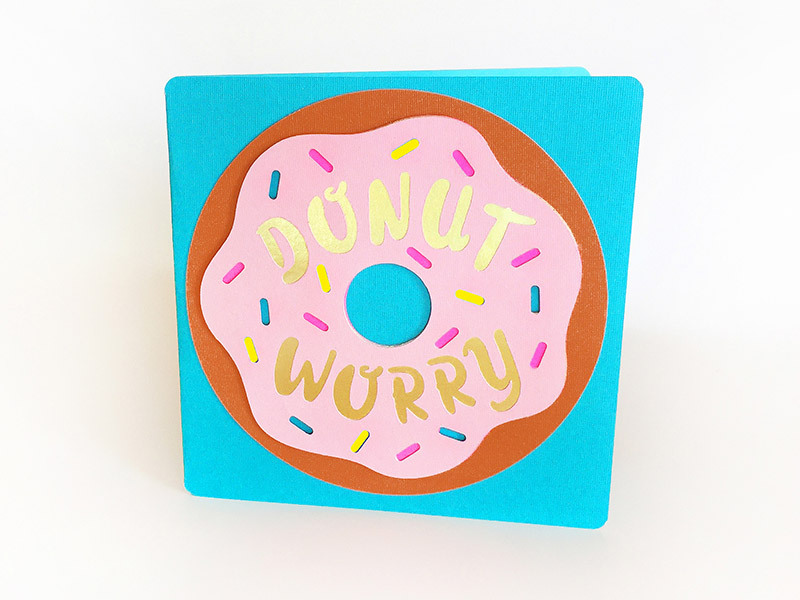 Beginning with the brown base layer and working your way upward, adhere the yellow, bright pink and gold foil pieces, and top it off with the soft pink “Donut Worry” layer. For the inside greeting, begin with the yellow layer, then adhere the bright pink layer, and finish with the written greeting layer. Our favorite part about this fun project? All the sprinkles! Tell us a bit about the next project. We call it “My Wine Club,” and we love it because it adds a touch of cheeky humor to your kitchen or dining room. We should add that we found it helpful to watch a few videos on how to use Cricut vinyl before we started. Rob & Bob used mixed fonts from their Market Street Collection to create this fun project. From top to bottom, they are: Postcard, Early Bird, Churchill and Boardwalk. You can get them here. Can you take us through your process? Yes, we broke it down into three main areas: cutting, preparation and application. Place vinyl (liner side down) onto Cricut Light Grip cutting mat. Set the material dial to Vinyl. Gently place the transfer tape (adhesive side down) over the images. To prevent bubbles, start in the center and move out toward the edges. 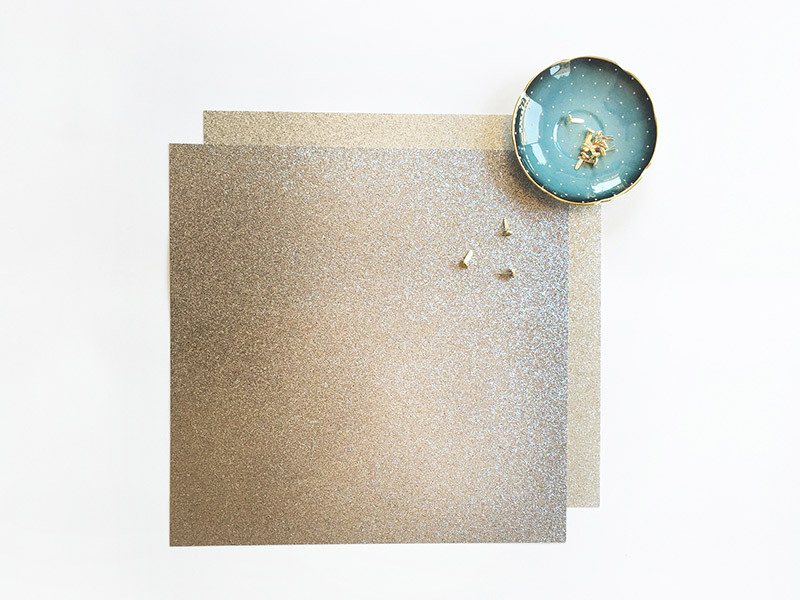 Use a craft stick or the scraper found in the Cricut tool kit to burnish (rub or polish) the tape onto the vinyl. Make sure your project surface is clean and dry. Carefully place the transfer tape with vinyl images onto your surface how you would like them to appear. Now burnish transfer tape onto the surface, starting in the center and moving out toward the edges. Use a craft stick or Cricut scraper. Peel away the transfer tape from the vinyl at a 45-degree angle. If the vinyl images stick to the transfer tape, simply burnish the transfer tape onto the vinyl and peel away again. 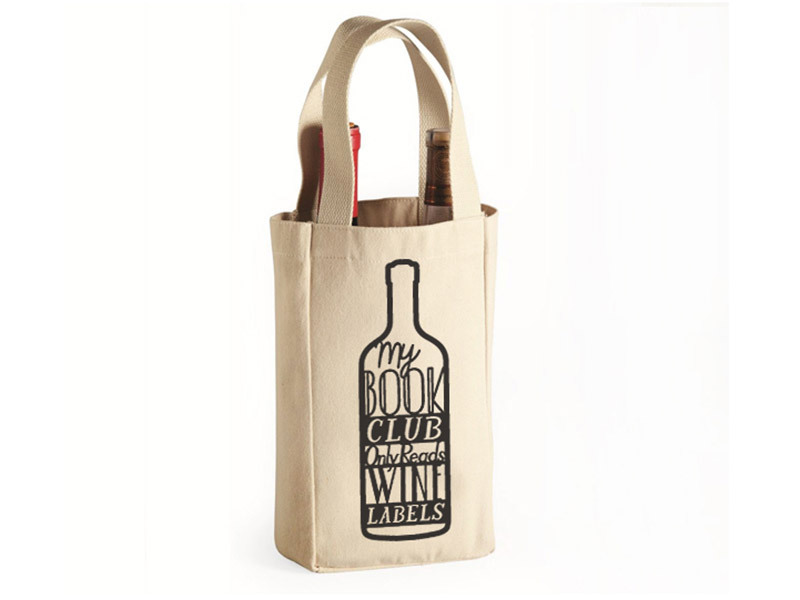 You can also use these fonts with iron-on material to make this super-fun wine tote and gift bag. Cheers! 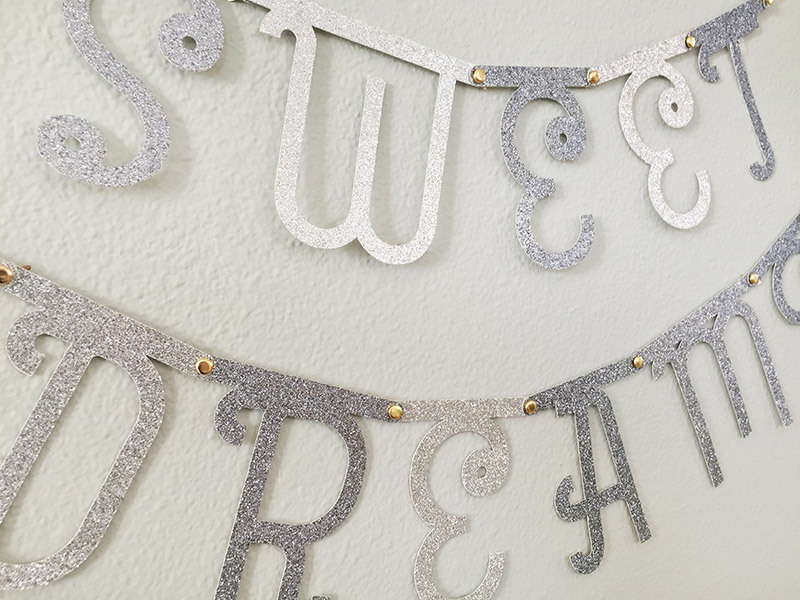 And finally, tell us about your Sweet Dreams Banner and Sprout Font. We couldn’t think of a better way to show off our new Sprout Font than this fresh and simple banner. When we were first thinking about the project, our niece had just moved into her first "big girl" bedroom, and she loves sparkle. We created the banner to go above her bed, and it was so easy to assemble. She put the banner together herself and was so proud of it! Everyone, regardless of age, can appreciate the good wishes in Rob & Bob’s banner. What’s on the materials list? Pictured here is everything you need: if you’ve got paper and brads (and, of course, your Cricut), you’re good to go! These guys think of everything: Rob & Bob included plain pieces so that you can extend the length of the banner or add extra spacing between letters and icons. Thank you so much for this amazing collection of projects. We were happy to do it. These ones are special to us because they brought a smile or giggle to everyone we showed them to. After all, having fun with these fonts is the whole point! Can’t get enough of Rob & Bob? 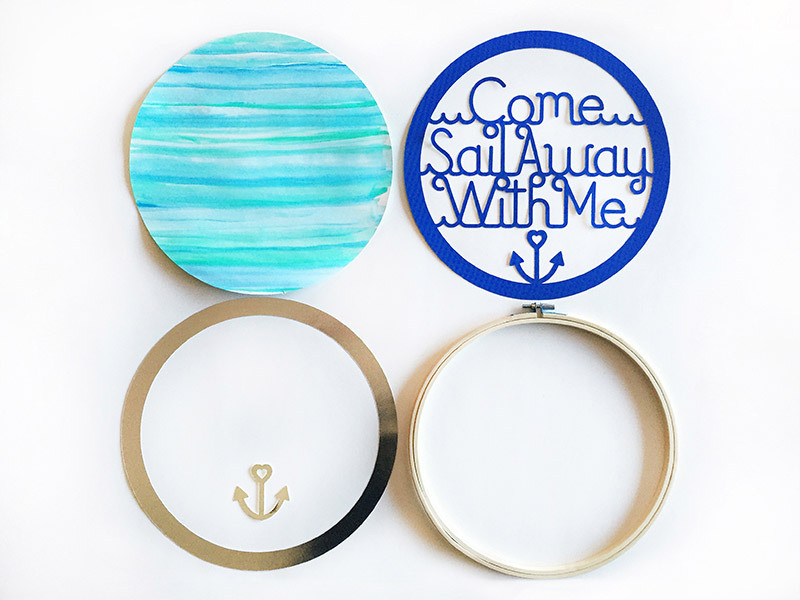 Check our their Cricut page. Love this! 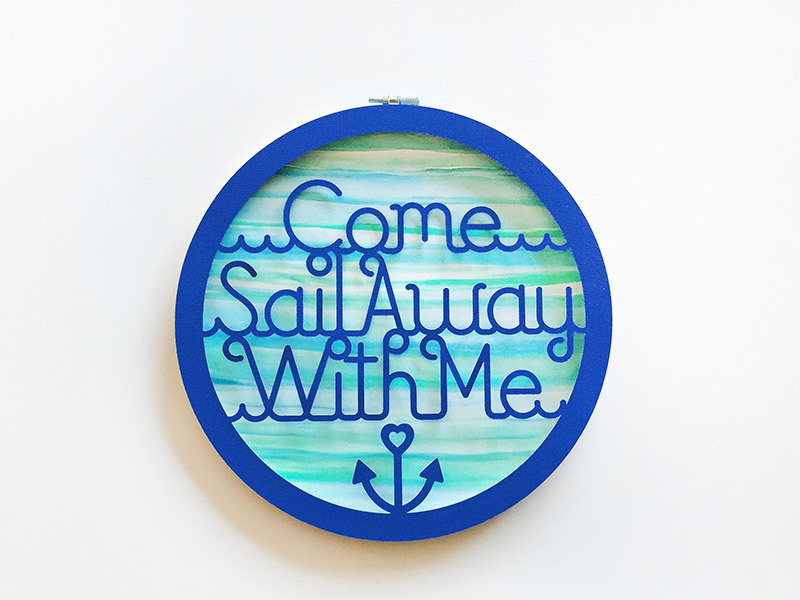 Like the hoop with Come Sail Away. Love it! Great job Rob and Bob! Keep bringing us fun new designs and style! Love them, will be trying all of them. 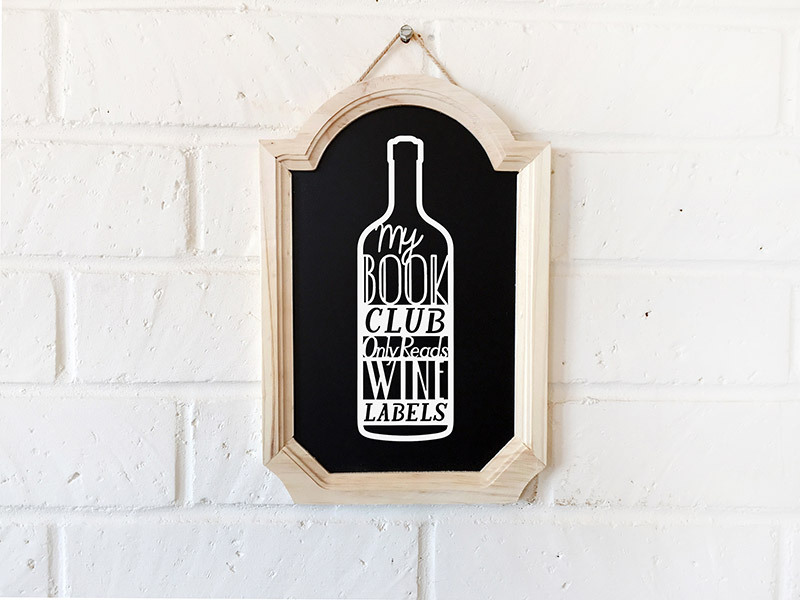 Love that book club sign!!! Thank you!